This will be my last reminder to make sure you 1) review either Kiss Across Chains, or Kiss Across Swords, and (2) very important; Send me proof of your review so I have something to put in the hat, and so I know who you really are (and so that I have your email address to contact you if you’re the winner!). To help pave the way for the launch of Kiss Across Deserts, the fourth book in the Kiss Across Time series, I’m giving away a $100 Amazon gift card. Have you started reading the series yet? Already read it? 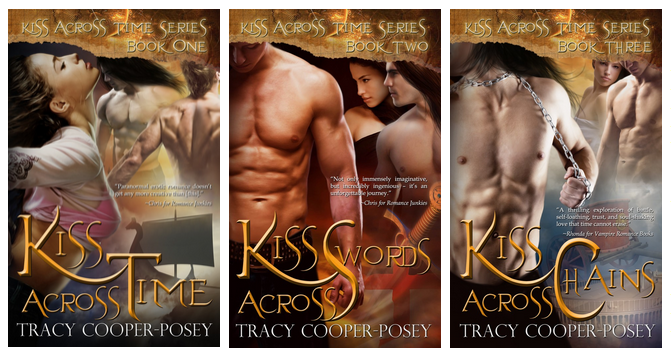 Then all you have to do is post your reader review on either Kiss Across Swords (Book 2) and/or Kiss Across Chains (Book 3), to Amazon, or any of the retail sites (Kobo, B&N, All Romance eBooks, iTunes). Send me a copy of the confirmation email the retail sites sends you that says your review has been posted (or a screen shot of the dashboard where you submitted it), and you’ll be entered in the draw. And I just know you’re smart enough to have figured out that if you do reviews for both books, your chances of winning double. You’ve got time: the draw will stay open until just before Kiss Across Deserts is released on May 8. Entries will close at midnight MST, on Thursday, May 7, and the winner will be contacted then. The winner will be announced on May 8, release day. Not familiar with the series? Find out more here. Kiss Across Time, the first book in the series, is free. Click here to get download information.